Another rice dish I love is steamed rice with la chang (in Mandarin) or lup cheong (in Cantonese). The Chinese style sausage is steamed with the rice. 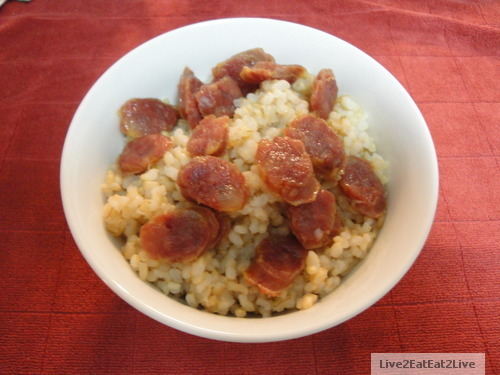 The fat in the sausage melts into the rice and adds flavor. For obvious reasons, my doctor and The Cat limit my frequency of eating this dish. When The Cat allows me to eat this (like tonight), YUM! I should be given a little credit for using brown rice. This post is short, The Mouse is too busy eating.